It’s a tricky thing, reviewing a book that’s a recommendation from a friend (or in this case an I Will Dare reader). Well, I guess it’s only tricky when you didn’t enjoy the book. If you liked it you’re in the clear. I’m not in the clear here. I picked up So Long, See You Tomorrow because one of my readers wrote so lovingly of William Maxwell. Since I’d never even heard of him I thought I’d start small (this is a slim, 135-page novella) and go from there. Unfortunately, I took my Rock & Roll Bookclub along for the ride and I’m not sure if they’ll ever forgive me. “It’s a hundred and thirty-five pages, but it reads like five hundred,” Adam, one of our members said when we met to discuss the book. It’s the most apt description of this book that I have found. Never have I had to trudge so hard to get through 135 pages. This is a toughie. The book is narrated by an older man who is reflecting on his childhood — the death of his mother when he was ten, the murder-suicide of two men in his town, and the loss of his only friend, Cletus, who is the son of the murderer. The problem here is not the subject matter, the problem is that this story is told with such remove that as a reader I never felt I was on solid ground. It’s really floaty and amorphous the way the narrative goes back and forth in time. And then there’s the fact that the entire second half of the book isn’t even “real.” At least real in the world of the novel. What happens is the fictional narrator of this fictional story creates another fiction. He tells us what he imagines are the events leading up the murder-suicide and what happens afterwards by telling the story through the point of view of many of the people involved. At least they way he imagines it would have happened. It’s confusing. As a reader I’m willing to suspend by disbelief for one level of fiction. But when the fictional characters in the novella start with the “this is how I think it could have happened” I’m done. It’s a weird line to draw saying these characters are more real than those characters and therefore worthy of my attention, emotional involvement, my sympathy, but there you have it. Maybe this would have worked for me, if the narrator had framed the second half of the novella, the made up portion, if he had given us a better context for it. If he had explained why it was necessary for him to make this stuff up because without this he couldn’t go on. But he pins the need for this whole imagined series of events on a glimpse of Cletus in a Chicago high school and the guilt that came with not saying hi to him. Not helping matters is that this made up story of Cletus’ life comes so late in life, when the narrator is an old man. Why now? I don’t know. 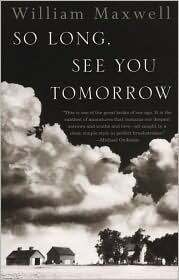 So Long, See You Tomorrow is a confusing, slow-moving jumble of a story that I never figured out why it was being told or why I continued to read it.